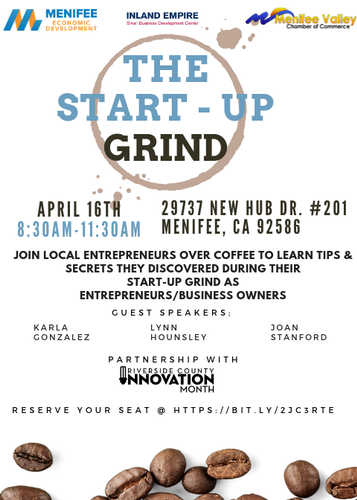 Join local entrepreneurs over coffee to learn tips and secrets they discovered during their Start-Up Grind as entrepreneurs/business owners. 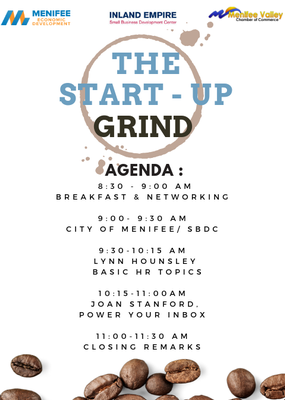 Hosted in partnership with Riverside County Innovation Month, the City of Menifee, the Chamber of Menifee and the B3 Program we will be hosting Start-Up Grind! 9:30-10:15 AM Lynn Hounsley, Integrity HR, Inc.: This seminar will offer employers a discussion on how to reduce their company's risk of fines, penalties and employment related lawsuits by providing the tools and training to identify and correct areas of non-compliance within the company's human resources function. 10:15-11 AM Joan Stanford, Jazzy Pen Communications will discuss Powering Your Inbox: This discussion will provide you with the keys to effective email marketing: -What it really is (and isn't) -What it can do for your business -And the five easy steps you must take to harness the power of inbox -Grow a healthy list -Create great content -Customize a beautiful, mobile-friendly template that matches your brand -How to get your emails opened -Tracking your results From revealing why regular email doesn't work, to insider tips and technologies like automated list building tools and the design elements that work (and those that don't! ), this seminar will give you the keys to the most effective marketing you can do: email marketing.